#1 Divining Rod (6-1): The wildcard added Lasix, stretched to two turns, and gave one of today’s heavyweights, Ocean Knight, one heck of a tussle in the local prep, the GIII Sam Davis last time, and he certainly bears further scrutiny here as he looks to prove that that run was no fluke. Dig deeper and you’ll notice that it was his first dirt start at two turns as well, so just maybe this is what this son of Tapit wanted to do all along for Delacour, which would be no surprise as dad was two turns through and through and is the hottest sire on the planet. The rub is big, though, because if you didn’t go to the wedding last time at 28-1, do you want to risk carrying the casket at the funeral at about a quarter of that price? The other side of the coin, if you believe, is that you’re getting a mighty nice price on a colt that could be the inside speed in a relatively paceless race, is bred to be something, and just flexed his muscles over the track in his first start going two turns; all in the eye of the beholder. #2 Ocean Knight (2-1): Aforementioned major player jumped over a lot of hurdles when he won the Davis, most notably facing winners and two turns for the first time, not to mention shipping a thousand miles or so from Aqueduct, where he won his debut in November. Son of Curlin might actually rate the best of the McLaughlins now, after stablemates Frosted and Imperia fizzled in their last starts, and you have to think, with just two lifetime starts, the sky’s the limit. But much like the 1, you have to ask who he was beating and how he stacks up against a tougher crew, as this one is no doubt that, plus he’ll be another short price, so he’ll have to improve again to get his picture taken. But recency, talent, and a win over the track go a long way in this game, so with that tightener behind him, there’s no reason to think he doesn’t move forward again today; onward and upward. Carpe Diem and John Velazquez at Keeneland. 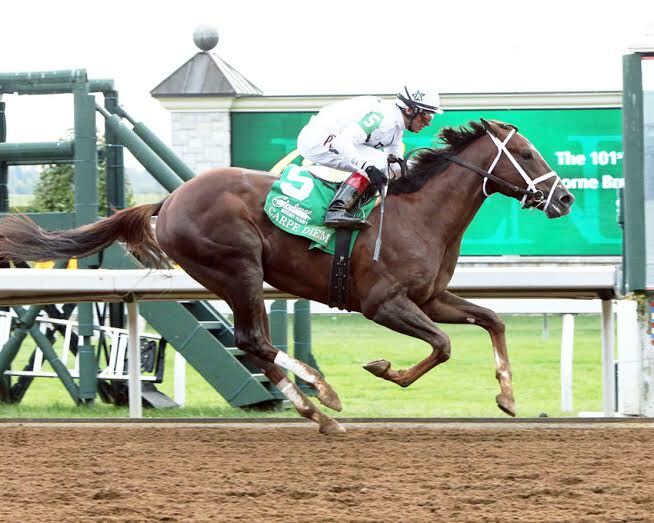 Credit Keeneland photo. #3 Carpe Diem (8-5): The forgotten horse makes his seasonal debut for Pletcher after an abbreviated but highly successful juvenile campaign that saw him win a laugher in a brutally bad renewal of Keeneland’s GI Breeders’ Futurity before closing out his campaign with a distant second to Texas Red in the BC Juvenile at Santa Anita. Beautifully bred son of Giant’s Causeway cost $1.6 million at auction, but the Coolmore boys have already gotten out and then some, and you have to admire the tactical speed and stamina that is part of his package. But don’t forget that you’ll be taking a short price on a horse that took a long time to get to the races this year and certainly has bigger goals in mind, not to mention that he never really ran all that fast last year to begin with; tread very lightly here. #4 Ami’s Flatter (15-1): Price player didn’t run all that poorly in the Davis when he was fourth and now gets the total makeover with blinkers and Lasix going on, which has been known to wake up a horse or two in the day. Lightly raced son of underrated sire Flatter made his two-turn debut in the Davis, too, so there’s a ton of upside for Carroll, who isn’t known by many but has done a great job on the national scene when she gets a good one (think Careless Jewel). Obviously this colt is looking up at the heavy hitters here, but he’s got plenty of room to grow, comes from sharp connections, and gets some equipment changes, so a big move forward isn’t out of the question; longshot players have their hero. #5 My Johnny Be Good (15-1): Colonel John homebred pressed ‘Rod before relenting to finish third in the Davis and is yet another who needs to show that that effort wasn’t a fluke, as he meets a saltier group today. Harty has enjoyed a nice meet and obviously knows what makes a son of Colonel John tick, and there’s tactical speed here, too, in a race that doesn’t really have ton of pace, so he’s eligible to trip out nicely–though when push comes to shove and the real running begins, it’s hard to think he can turn the tables on the top guns, not to mention hold off the newbies; underneath, if at all. #7 Great Stuff (20-1): GP invader is winless in three starts but is going in the right direction for Wilkes, though this isn’t an ideal spot to earn a diploma. Son of Quality Road will get to stretch his legs around two turns for the first time today and that could move him up even more, and the horse that beat him last time by a head—Lieutenant Colonel—is entered in Aqueduct’s Gotham about a half hour before this one, so you can get a bit better gauge on both by watching that one. As if being a maiden wasn’t bad enough, there’s also no speed at all in this corner, which means he’s going to be spotting some nice horses open lengths and will be trying to rally into what is expected to be a moderate pace, which dilutes his chances that much more; minor award appears his ceiling. #8 Moonlight Bandit (30-1): The longest shot in the race is the first of two for Casse and Oxley and really looks out of his element here, as all he shows on his resume is a Churchill Downs maiden win in October, which was won in slow time to boot. Malibu Moon colt prepped for this in a GP optional claimer on the turf to kick off his campaign, but that third-place run isn’t going to scare any of the bigwigs in here, so he’s going to need to do a lot better to threaten. And you have to wonder if he can, as his lone stakes try was a dismal 11th in Aqueduct’s GII Remsen to close out his 2-year-old season in November, so even though he’s probably better than that, it’s tough to think he can make a dent here; needs much softer. #9 Danzig Moon (12-1): Dominant GP maiden winner built on the promise he showed in a pair of solid runs as a 2-year-old for Casse and enters this as your typical “could be any kind” of 3-year-old. Son of Malibu Moon will test two turns today, but he’s bred top and bottom to excel at the trip, though this wide draw did him no favors, so he’ll need to try and save some ground into the first turn. The good news is that he seems comfortable stalking outside of horses, as that’s the exact trip he pulled when breaking his maiden, so if he doesn’t lose a ton of ground early, he’s going to be in the right spot when they hit the far turn. The hurdles are steep, as he goes right into graded stakes for his first try against winners, but there’s a ton of talent here, and if he can bridge the gap, then you better look out; thinking he makes his presence felt.